Damn. I'm currently being run over by the flu. So far, it's just Ez and I. So far. Conveniently, in a spurt of energy yesterday (I should have known! that always happens before I get sick! ), I made a few posts at once. So excuse me while I go sleep and sleep and sleep and sleep (who am I kidding? ), and put the blog on autopilot for the next three days. That was fun. Now I'm ready for the sugar to be gone, the gift making and wrapping to be done, the tree and it's falling needles to go back outside, and for life to otherwise return to 'normal'. But before I wrap up the holidays (ha!) completely, here are a few shots of the gift crafting I've been up to this month. Sadly, many things left the house in that window of time when I had no camera, so alas, no photographs. But from these pics you can see the theme of the year: bags and pillows. Hmn. First up, the bags. I made a *bunch* of these. 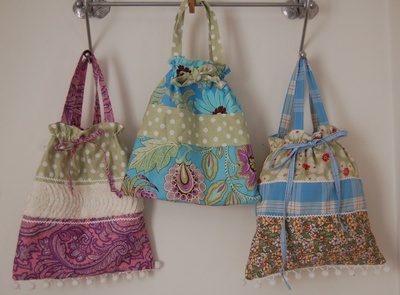 So fun to use up scraps and things (the one on the right is staying at my house--and it's made entirely from some of my favorite clothes that are too small for me now. Ahem.). These are from the Amy Butler pattern--In Town. 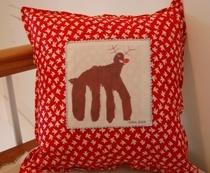 Speaking of Amy Butler, I used this fabric from the Ginger Bliss line to make these pillows. So cute. Not sure you can see it or not, but I "quilted" the fabric to batting before stuffing them. I like the way it looks. 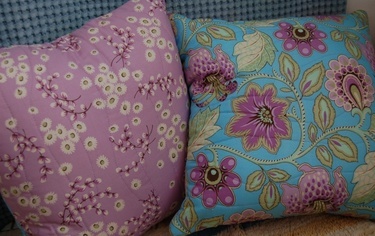 Though, it kind of reminds me of these weird 70's pillows my grandmother used to have. Weird. And for the grandparents. An embroidered picture from a piece of Calvin's art. You might remember that it looks remarkably like another one he did. He just added Adelaide onto this one. 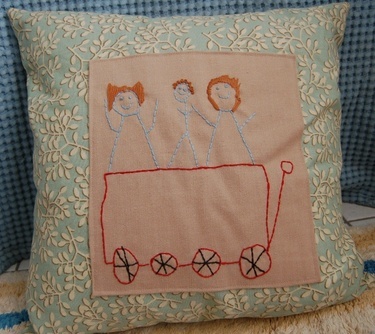 I loooove how different the hairstyles are on each person--and it was so fun to embroider the hair. 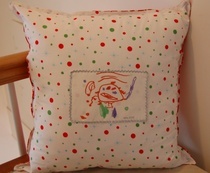 And for the other grandparents, a holiday pillow with a photo (printed onto fabric with Bubble Jet Set) of each of the kids art on each side. And some snazzy metallic rick rack, just 'cause.